Phaeacians - They lived in the island Scheria (may have been an old name for the island of Kerkyra/Corfu before Corinthian colonization) (mentioned in the Odyssey as a people that welcomed Odysseus before his return to Ithaca). Pelasgians (mentioned in Iliad's Catalogue of Ships and in Trojan Battle Order) - They lived scattered through several regions of ancient Greece (like Pelasgiotis). Cynurians - They lived in Cynuria (East Peloponnese Peninsula). Magna Graecia (Μεγάλη Ἑλλάς - Megálē Hellás) ancient colonies and dialects in the Classical Age (before Roman conquest). Major regions of mainland ancient Greece, and adjacent "barbarian" lands. 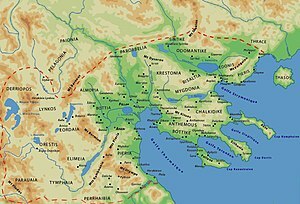 Ancient Regions of Epirus and Macedon. Ancient Regions of West Central, North and West Greece. Ancient regions of Central Greece. Achaeans (Broader sense) - They lived in Eastern, East Central and Southern Greece (Mycenean Greece) before Dorian migrations or Dorian invasions (after that most Achaeans were displaced or assimilated by Dorians in Southern Greece regions, except for Arcadia). They spoke Mycenean Greek that was the ancestor of Aeolic, Arcado-Cypriot and Ionic Greek dialects of Classical Greece. Aeolians - They spoke Aeolic Greek dialects (archaic dialects that preserved some Mycenean Greek features). Thessalians - They lived in Thessaly (Thessalia/Aeolia). Mount Olympus is on the border between Thessaly and Macedon. Achaeans, Phtiothis - They lived in Achaea Phthiotis. Histiaeoteans - They lived in Histiaeotis, Thessaly's Northwest district. Perrhaebi (Perraiboí) - They lived in Perrhaebia, Thessaly's northernmost district. Thessalians Proper - They lived in Thessaliotis. Asia Minor Aeolians - They lived in Aeolis, Northwestern Anatolian coast. Lesbians - They lived in Lesbos Island. Achaeans (Narrower sense) (Arcado-Cyprian tribes) - They spoke Arcado-Cypriot Greek dialects (archaic dialects that preserved some Mycenean Greek features). Arcadians - They lived in Arcadia (Central Peloponnese Peninsula) and were a pre-Dorian invasion or Dorian migration Greek tribal confederation. Triphylians - They were a group of three tribes (Tri - Three, Phylai -Tribes) that lived in Western Peloponnese, in southern part of Elis (south of Alpheiós river) but saw themselves as Arcadians and not Eleans. Pamphylians - They lived in Pamphylia (South-West Anatolia). Ionians - They spoke Ionic Greek dialects (basis of the Greek Koiné and his descendant Modern Greek). Euboeans (West Ionians) - They lived in Euboea Island. Chalcidicians, Euboean - They lived in the Peninsula of Chalcidicia (many were descendants from Euboean colonies from the cities of Chalcis and Eretria). Catanians - They lived in Catania, Magna Graecia (many were descendants from a Euboean colony from the city of Chalcis). Cumaeans - They lived in Cumae, that was founded by settlers from Euboea island (from Chalcis and Eretria cities) in Magna Graecia. It was one of the Greek colonies that most influenced ancient Etruscan and Roman cultures, namely by the introduction of the Alphabet. Cumae by itself was the Metropolis of other poleis in southern Italy coast, including Nea Polis (New City), today's Naples (it was to the West and close of Naples). Neapolitans - They lived in Naples (many were descendants from Rhodean and Ionic colonies, the last ones were more numerous). Ionians, Cycladian (Central Ionians) - They lived in Cyclades Islands. Delos Island that had the important Delos sanctuary was in this group of islands. Chalcidicians, Cycladian - They lived in the Peninsula of Chalcidicia (many were descendants of a colony from Andros Island). Asia Minor Ionians (East Ionians) - They lived in Ionia, Western Anatolian coast. Sirisians - They lived in Siris in Lucania/Basilicata eastern coast (many were descendants of a colony from the city of Colophon, in the Western Anatolian coast). Dorians - They spoke Doric Greek dialects (that were not descendants of Mycenean Greek but from a common Proto-Greek language). Acarnanians, Northwestern Greek - They lived in Acarnania (this region had two groups of Greeks: the native Northwestern Greek Acarnanians and the Dorians Proper Acarnanians, many of whom were descendants from Corinthian colonies). Achaean Dorians - Many were Achaeans assimilated by Dorians. They spoke a Northwest Greek dialect but with a stronger Achaean Greek substrate. They spoke Achaean Doric Greek (not to be confused with Achaean Greek). Achaean Dorians of Peloponnese - They lived in Achaea (whose older name was Aegialus/Aegialea and was dwelt by Ionians) (North Peloponnese Peninsula). Crotoneans - They lived in Crotone (Eastern Calabria coast), Magna Graecia (many were descendants from an Achaean colony from the city of Rhypes). Doulicheis - Older dwellers of Leucas/Lefkada Island (before Corinthian colonization). Before Dorian Invasion or migration it was dwelt by Ionians (thus the name Ionic Islands). 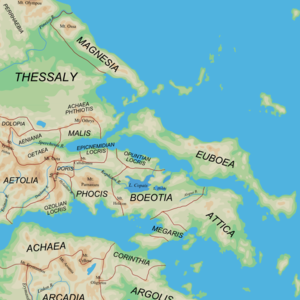 Ithacians - They lived in Ithaca Island (the land of the legendary Odysseus, the main character of the Odyssey and also one of the main ones in the Iliad whose author is traditionally thought to be Homer). Before Dorian Invasion or migration it was dwelt by Ionians (thus the name Ionic Islands). Kefalloneis - They lived in Kephalonia Island. Before Dorian Invasion or migration it was dwelt by Ionians (thus the name Ionic Islands). Zakynthians - They lived in Zakynthos Island. Before Dorian Invasion or migration it was dwelt by Ionians (thus the name Ionic Islands). Aenianians - They lived in Aeniania/Ainis. Aetolians/Curetes - They lived in Aetolia. Eurytanians (Eurytanes) - They lived in Eurytania/Evrytania. Amphilochians - They lived in Amphilochia. Eleans - They lived in Elis (West Peloponnese Peninsula). Olympia, were the Ancient Olympic Games were held was in Elis. Epirotes (Epirotic Dorians) - They lived in Epirus. Chaonians - They lived in Chaonia. Molossians - A tribal confederation. They lived in Molossis/Molossia. Aethikes/Aethices - They lived on Mount Pindus and in the neighborhood of Mount Tomarus. Amantes/Abantes/Avantes - They lived in Amantia. May have been a hellenized Illyrian tribe related to the Amantini. Apheidantes - They were named after king Apheidas. Dodonaioi or Selloi  - Dodona sanctuary and oracle was in their land. Lyncestai They lived in Lynkestis. Orestaes - They lived in Orestis. Parauaei/Paroraioi - They lived in Parauaea, Northern Pindus Mountains. Paroraioi (Paroraei) - They lived in the western slopes of Mount Tymphe, Northern Pindus Mountains. Pelagones - They lived in Pelagonia. Talares - They lived on Mount Pindus and in the neighborhood of Mount Tomarus. Tymphaeans - They lived in Tymphaea, eastern slopes of Mount Tymphe. Thesprotians - They lived in Thesprotia. Subtribes or Clans: Aegestaeoi; Chimerioi; Eleaeoi; Elinoi; Ephyroi; Elopes; Fanoteis; Farganaeoi; Fylates; Graeci; Ikadotoi; Kartatoi; Kassopaioi (Kassopaeans); Kestrinoi; Klauthrioi; Kropioi; Larissaeoi; Onopernoi; Opatoi; Parauaioi; Tiaeoi; Torydaeoi. Locrians - They lived in Locris. Malians - They lived in Malia/Malis. Thermopylae was in their land. Oeteans - They lived in Oetaea, included Mount Oeta. Phoceans - They lived in Phocis. Delphi sanctuary and oracle was in their land (on the southern slopes of Mount Parnassus). Dorians Proper They spoke Doric Greek dialects. Argives - They lived in Argolis (East Peloponnese Peninsula). Corinthians - They lived in Corinthia (Isthmus of Corinth and North-East Peloponnese Peninsula). Many Greek colonies were of Corinthian origin (i.e. Corinth was the Metropolis - Mother City, the origin of many Greek colonies). Acarnanians, Dorians Proper - They lived in Acarnania (this region had two groups of Greeks: the native Northwestern Greek Acarnanians and the Dorians Proper Acarnanians, many of whom were descendants from Corinthian colonies). Ambracians - Descendants of a Corinthian colony. They lived in Ambracia. Kerkyreans/Corcyraeans - Descendants of a Corinthian colony. They lived in Kerkyra/Corfu (Corcyra). (Phaeacians may have been the original inhabitants and called their island Scheria). Leucadians - Descendants of a Corinthian colony. They lived in Leucas (Lefkada) Island. Syracusans - They lived in Syracuse in South-East Sicily Island, Magna Graecia (many were descendants from a Corinthian colony). Cretans - They lived in Crete Island. Cythereans - They lived in Cythera (Kythera/Kythira) Island, south of Peloponnese Peninsula. Dorians (of Doris) - They lived in Doris (Upper Cephissus river valley). They were viewed as a people close to the land were Dorians originated - roughly south Epirus and Aetolia in Northwest Greece (when they migrated towards south). Laconians - They lived in Laconia (South Peloponnese Peninsula). Spartans-Lacedaemonians - They lived in Sparta/Lacedaemon a part of Laconia (South Peloponnese Peninsula). Tarantinoi - They lived in Taranto, Magna Graecia (many were descendants from a Spartan colony). Megareans - They lived in Megaris. Messenians - They lived in Messenia (South-West Peloponnese Peninsula). Thereans - They lived in Thera/Thira Island (Santorini). Cyreneans - Descendants from a Thera Island colony. They lived in Cyrene, Cyrenaica (Eastern Libya). Cnideans - They lived in Cnidus. Coans - They lived in Kos Island. Halicarnasseans - They lived in Halicarnassus. Rhodians - They lived in Rhodes Island. Camirians - They lived in Camirus. Ialysians - They lived in Ialysos. Lindians - They lived in Lindus. Macedonians - They lived in Ancient Macedonia and they spoke a version of the Doric dialect. Argeads - According to their oral tradition their tribe originally came from Argos, in Argolis, Eastern Peloponnese Peninsula (Argeads = Argives) (origin of the Macedonian ruling dynasty - The Argeads - House of Argos). Elimiotai  - They lived in Elimiotis/Elimeia. Eordeans - They lived in Eordaia. Magnetes - They lived in Magnesia (most of Thessaly's coastal region). They were seen by ancient Greeks as a people that shared a common ancestor with the Macedonians. ^ Wilkes, John. The Illyrians (The Peoples of Europe). Wiley-Blackwell, 1995, p. 97. ^ The Illyrian Atintani, the Epirotic Atintanes and the Roman Protectorate N. G. L. Hammond, The Journal of Roman Studies Vol. 79 (1989), pp. 11-25 "There were Illyrian Amantini in Pannonia and Greek Amantes in North Epirus"
^ Mogens Herman Hansen and Thomas Heine Nielsen. An Inventory of Archaic and Classical Poleis. Oxford University Press, 2004, p. 345. ^ Mogens Herman Hansen and Thomas Heine Nielsen. An Inventory of Archaic and Classical Poleis. Oxford University Press, 2004, p. 338. ^ a b c John Boardman and Nicholas Geoffrey Lemprière Hammond. The Cambridge Ancient History Volume 3, Part 3: The Expansion of the Greek World, Eighth to Sixth Centuries B.C. Cambridge University Press, 1992, p. 284. ^ Woodhouse, William John. Aetolia: Its Geography, Topography, and Antiquities. Clarendon Press, 1897, p. 70. "Ptolemy, however, makes them neighbours of the Epirot tribe of the Kassopaioi, who lived on the coast of the Ionian sea." Strabo's The Geography (Geographica). Books 7, Chapter 7 and Books 8, 9 and 10 are about Greece (each region has a chapter).